X-SPEX, the specialist for video recording devices from Berlin presents a new DIRIS Board with versatile HD video ports from the 14. to 16. March 2017 on the “Embedded World” exhibition in Nuremberg. Besides the classic analogue formats YPbPr/Component and VGA/RGB there are now also two HDMI output ports and 2 HDMI input ports.The video recording and playback in H.264 format from an SD Card or USB flash drive. There are many recording options like an on-screen-overlay and a Pre-Trigger-Buffer. These are really flexible and aim to meet all of our customers requirements. Besides video I/O ports and several storage options there are ports for Audio, Ethernet and UART (optional: LVTTL, RS-232, RS-422 oder RS-485) on only 100 mm x 80 mm surface area. Operating the device either happens through directly connected buttons, via ethernet or UART. The board is really versatile when it comes to integrating it into your system. The equipping provides many possibilities. Especially all the external jacks can be replace with ZIF/FPC, to make the connection inside a device an alternative. Resulting out of this flexibility, the tolerant power supply(5..24V, optionally up to 36 V or 2,5..6V; standby power consumption < 100 μA) and the high temperature range (-20..80 °C, optionally up to -40..85 °C, the DIRIS board can be used in many different circumstances. 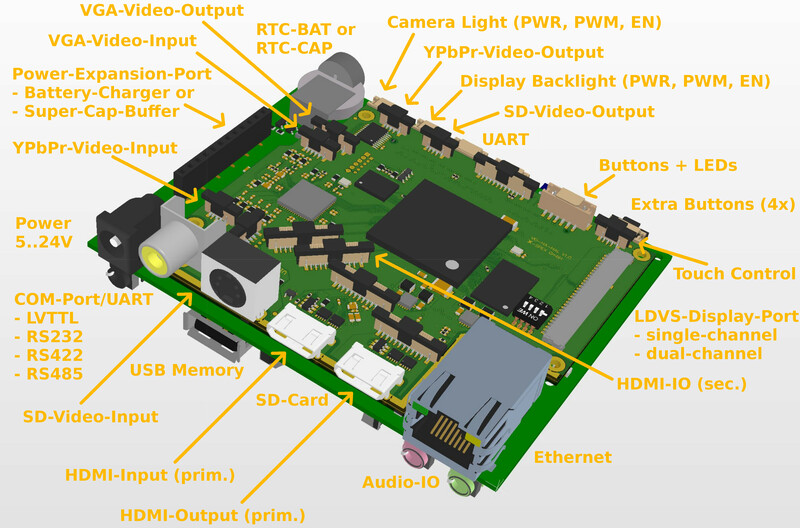 Besides the main function, the recording and playback of videos in high quality (> 10 MBit/s) with minimal delay ( < 80 ms) the DIRIS Board offers many more features, like a configurable zoom and a picture in picture (PIP) function. “The DIRIS board often replaces multiple components in a device. As SD video IOs are still available in the new products, customer may upgrade their products step-by-step”, says Raymond Horn, CEO of X-SPEX. X-SPEX offers OEM components capable of recording and playback of videos, designed for industrial and medical applications. For us the industrial quality, the simple usage, versatile configuration and, if demanded, the customer specific variations of our products have the highest priority. The in January 2003 founded company develops hardware and software directly in Berlin. The assembly of the DIRIS products is ensued with different partners from all over Germany. Additional information about X-SPEX can be found on https://diris.eu/en/ and about the DIRIS Board with HDMI on https://diris.eu/en/products/board/b02/ . X-SPEX has been an exhibitor on the “Embedded World” for over 10 years now, always at the same place (hall 1, stand 481).